Rachel is still looking for this dog. After researching more, she has learned that the dog is a “Dayton Hudson” brand and identical material to the PJ Huckabee bear that was sold in Marshall Fields in 1994. It was 16 inches tall and came with either white or golden fur. All bears and puppies came with a plaid ribbon around the neck. 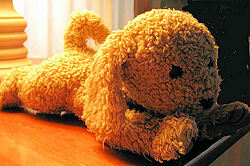 We lost a GOLDEN BROWN family favorite stuffed dog in a Florida airport in 1996. The dog was originally bought at Marshall Fields in Chicago during Christmastime in about 1994. It was approximately 18″ long with floppy ears, a curled tail and curly fur. At the same time, we bought a smaller (approx. 8-10″), but identical dog. Not quite the pup we’re looking for 🙁 the one we are looking for is the exact same as in the picture shown– just a little larger. Still looking! Thanks for the help! I am still searching for the puppy. After researching more, the dog is a “Dayton Hudson” brand and identical material to the PJ Huckabee bear that was sold in Marshall Fields in 1994. It was 16″ and came with either white or golden fur. All bears an puppies came with a plaid ribbon around the neck. Has anyone seen either the puppy or the bear?? Is this the bear you want? Yes, that is the identical teddy bear. However, we are looking for the dog!